One day marathon run to South Dakota. Targeted favorable tornado parameters in warm front/dryline bounded warm sector in southeast South Dakota which cap busted. Intercepted non severe storms in east central SD after dark. Camped in vehicle overnight and was hit by squall line. Parameters looked great in southeast South Dakota for a few tornadic supercells on May 5. Tornado indices were spiking quite high where instability and directional shear were both strong along the warm front. SPC was on board with a high end slight risk and the possibility of strong tornadoes. I made the drive out there taking 90 across southern Minnesota. I wound up in Yankton where the warm front was setting up. A cumulus field had developed in the warm sector and I was hoping that would build into storms by later afternoon. I caught up with Rob Hurkes, James Seitz, Jon Williamson, Jeremy Degenhart, and Nick Nolte and we chilled in Nebraska just across the river from Yankton. We waited and waited some more. The cumulus had long since vanished and our prospects of a warm sector chase were looking pretty bleak by later afternoon. High based cells fired way down in southwest Nebraska and junk was starting to pop north of the warm front in central South Dakota. I knew neither area would produce tornadoes though. As our cap bust became painfully obvious we all stopped at the Subway in Yankton for dinner. It was the second of three times on three different chases that year that I had stopped at that particular Subway. We split up after dinner. Some of the warm front storms were picking up severe warnings so I decided to go after them. I hadn't driven all that way just to blow off the only storms that there were, even if they had no hope of producing in the cool air north of the warm front. 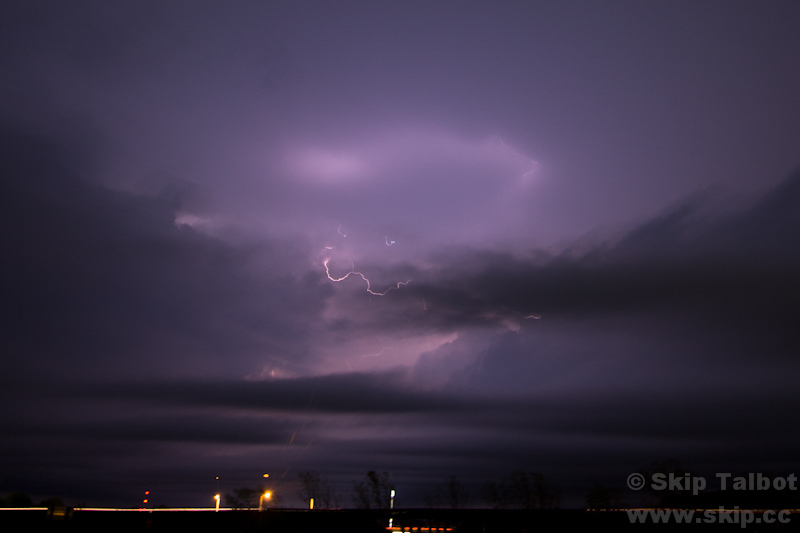 I caught up with the storms near Salem, SD. They were low to the ground, scuddy, and had some neat motion. I setup for some lightning stills and to try and get some of the low level clouds. This craptastic cloud to cloud bolt is about all I could manage before I decided to call it a night and find a place to camp in the van. I found a dirt road south of Beresford on which to camp for the night. It was hard packed dirt so I figured it would be ok overnight. That turned out to be a mistake when an overnight squall line turned the road to mud and I spent an hour trying to get out of there the next morning. The squall line was one of those intense ones that I loathe when camping in the vehicle, where the winds shake the van, hail is coming down, and I don't know if that's it or if there is a tornado coming as well. I wound up scrambling to get the radar going to figure out what was happening. Even though I saw storms on this chase, my main target cap busted. The storms I caught north of the warm front after dark were a small token for making the trip, but definitely did not justify the distance put into it. The whole setup wound up busting everywhere for tornadoes or decent surface based supercells and May 5 would go down as one of the biggest chase forecast busts of the year. Ten hatched in South Dakota isn't always the promised land. Watch for overnight squall lines when camping in your vehicle.